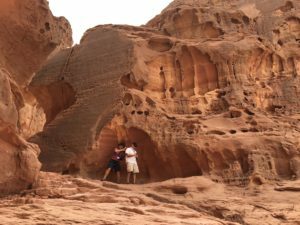 The Petra challenge behind us we travelled south along the King’s Highway (Numbers 20:17) all the way to the port of Aqaba in Jordan, where we made the crossing to Eilat. The crossing was relatively smooth, though dragging our suitcases in the no-man’s land between Jordan and Israel in 30+ heat took a bit of energy. 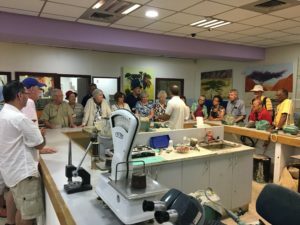 A quick stop at an Eilat Stone factory and then we were off to our hotel. The Eilat Stone is Israel’s national stone, it is green and blue – a chemical derivative of copper, which is mined near Eilat. 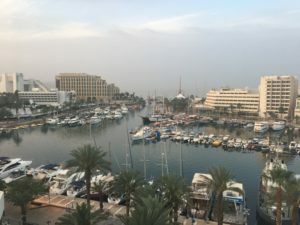 Our hotel is right on the Red Sea, a short walk to the beach. 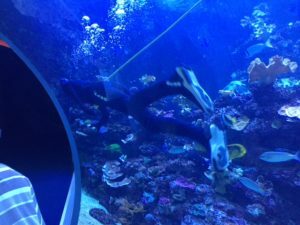 Some of us made a stop at the Red Sea Aquarium/Observatory…others went snorkeling along the same reef on which the underwater observatory is built…there were a LOT of beautiful purple jelly-fish…the non-stinging kind, but our snorkelers were not taking any chances. 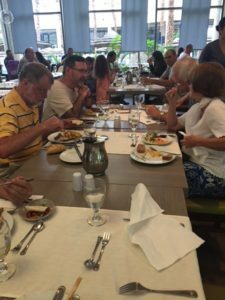 The food has been very good, especially in the big resort areas such as Eilat. Dainty desserts (such as this one) are very tempting. Enjoying our dinner in Eilat. 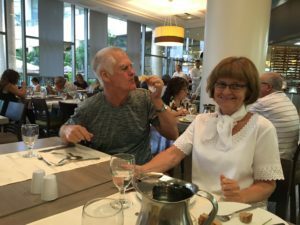 The food choices are endless – surveying the buffet options seems to be a 1km walk each night. The next day we started driving north from Eilat…well, there is only one way to go in Israel from Eilat and that is north. The distance from Dan to Eilat is about 450 km. We have covered it all. 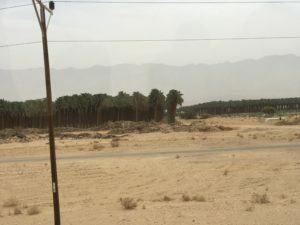 Date palm groves along the way in the Aravah – Israel is the largest exporter of dates in the world. 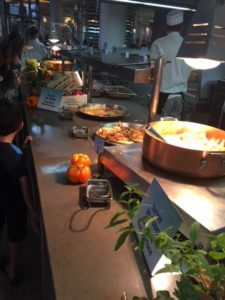 We had fresh dates in Galilee and they were amazing. 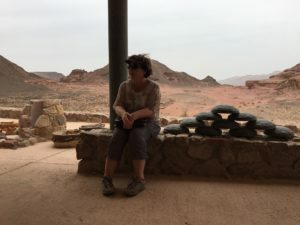 We stopped at Timnah Park – an expansive mountain complex, featuring ancient copper mines, Egyptian temples, unusual geography, mountain biking and more. 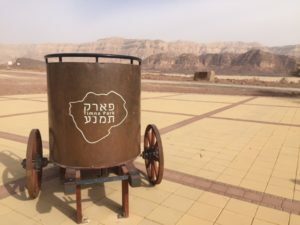 Here is a bronze chariot – welcoming us to the Timnah Park. 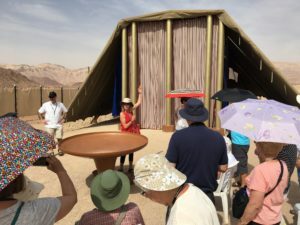 Our group just about to enter the Tabernacle in the wilderness – a full-size Tabernacle replica in the Timnah Park. It was over 40 degrees, so we were really grateful that the Holy Place is air-conditioned! It isn’t every day that you get to peek inside the Ark of the Covenant. 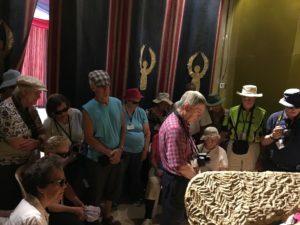 We were all very moved by the significance of the Tabernacle, how it points to Jesus as the door, the light, the bread, the mercy…and how amazing it is that the work of atonement is forever finished. We even got to play with coloured sand and bring a small bottle home with us. Ok, we have definitely been in the desert heat too long, the hikers in our group, who climbed up to the Temple of Hathor, were goofing off a bit. 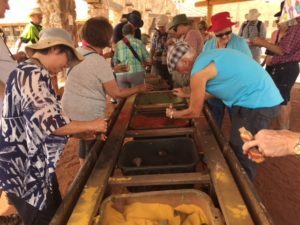 We ended our time in Timnah beside the ancient copper smelting ovens (note the giant foot operated bellows), with a devotional from Job 28 – the ode to wisdom. We made it to our great hotel on the Dead Sea and hurried down to the beach. The first time your body pops out of the water when you let yourself go is quite surprising. There was one exclamation of “Wow” and “Oh!” after another. We soaked in the healing minerals for quite a while, our fingers did not get pruney, and we felt generally happy. 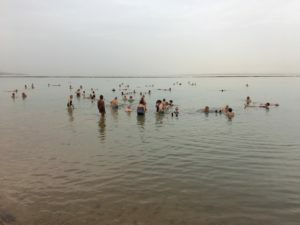 Some of the European health care providers cover stays at the Dead Sea to treat various ailments such as skin diseases, joint pain/arthritis and even depression. Here we are floating on the Dead Sea.